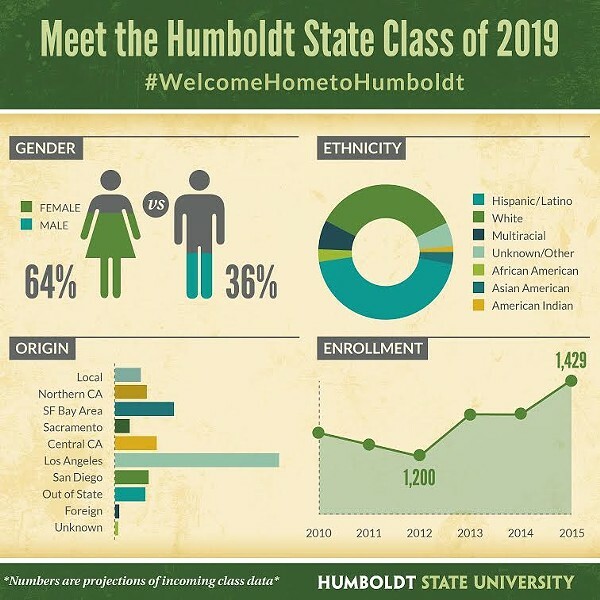 With a record influx of 1,429 new students, Humboldt State University has broken down the class of 2019 (hang on to your optimism, future super-seniors) by gender, ethnicity and from whence they come. A quick glance tells you women outnumber men by 28 percent. Students who identify as Hispanic/Latino form the largest ethnic group at 44 percent, according to an accompanying press release from the university. And you might have to cool it on making fun of Los Angeles, as some 38 percent of incoming students have traded smog for fog.